The Night Knights – Every kid deserves a good knight. MagicaL Play that TurnS BedtimE into fuN. Sir and Lady Sleep-A-Lot included with every copy! 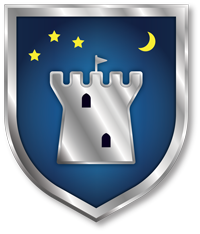 The Night Knights™ have an important quest – to keep children feeling comforted and protected while they sleep. Say hello to Sir and Lady Sleep-A-Lot™, sent on a fun mission to keep watch in kids’ rooms at night. Continue reading to learn more about The Night Knights™, and how to order so that the whole family can enjoy the exciting adventures that will happen once The Night Knights™ come to stay at your house. 1 Drawstring knapsack – to take your Night Knights™ wherever you go! Introductory Price. For Limited Time Only! "Our four-year old daughter loves The Night Knights™ story. She tucks in Lady Sleep-A-Lot™ and asks to read the book again and again at bedtime." "We LOVE our Night Knights! Sir & Lady Sleep-A-Lot™ have become a wonderful and comforting part of our bedtime routine. It was a special moment when we "knighted" our Night Knights together as a family and it is a novelty that doesn't seem to wear off. How amazing that we can bring them to sleepovers at Grandma & Grandpa's too, or any other place away from home so the kids (and therefore WE) can get the sleep we so desperately need. Thank you Night Knights!" "The Night Knights™ have been a wonderful addition to our bedtime routine. Sir and Lady Sleep-A-Lot™ have provided a lot of fun and giggles, not just for my four-year-old son and two-year-old daughter, but for us grownups as well!" The Night Knights™ are more than just a fun toy. They are an experience that stimulates children's imagination, helping them feel safe and secure at night. An adventure that the whole family can take part in, The Night Knights™ foster a love of reading and help children develop a sense of security when sleeping alone in the dark. Their personal Night Knights can help make going to bed a fun routine that they will look forward to. The Night Knights™ are a magical experience that parents will enjoy along with their children. Quests and fun missions are guided by parents and their imagination. Kids are delighted when they wake up and see how their Night Knights were busy keeping guard while they slept. Peaceful bedtimes make happy parents and better sleep for everyone! the story of The Night Knights™! The illustrated storybook introduces The Night Knights™ to children and contains the special ‘knighting’ ceremony that kids absolutely love. The book adds more depth to the whole experience and jump-starts children’s imaginations. When they wake up in the morning and see a new scenario of how their personal guards were busy while they slept, they know that their Night Knights were keeping them safe. How do The Night Knights™ work? The illustrated storybook shows your children that The Night Knights™ have been given to them by somebody who loves them very much. The story contains a special ‘knighting’ ceremony that transforms your children's Night Knights into their very own personal protectors who guard their bedroom from dusk until dawn so that they can get the sleep they need to grow, learn and play. When kids wake up in the morning to discover The Night Knights™ are in a different location or that they have "captured an intruder”, it lets them know that The Night Knights™ were busy on the job while they were sleeping safe and sound. The Night Knights™ embark on a great quest. The Knighting Ceremony, a fun time for the family. The Night Knights™ investigate every little noise. After a night's work, Night Knights take a deserved break.